On October 13, 2010, the Camarillo City Council voted to withdraw the City from membership in the Ventura County Library System (VCLS) and to operate the Camarillo Library as a municipal public library beginning on January 1, 2011. The decision appeared to be driven by finances...the City is expected to save nearly $700,000/year by running its own library by contracting with a private firm to do so. The firm selected, Library Systems & Services, LLC (LSSI), has decades of experience in providing contract library support services around the country, and locally administers the entire Riverside County Library System as well as the City of Moorpark’s library. Oversight of the LSSI contract, as well as all strategic planning and policy decisions regarding the Library including personnel policy, will be done by the Camarillo City Council, which will initially serve as the Camarillo Library Board of Trustees. All donations and grant funds received by the Library will remain 100% with the Camarillo Library -- most notably, the generous contributions made by the Friends of the Camarillo Library. 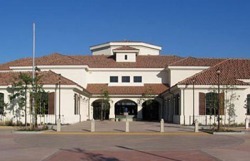 For Ventura County Library patrons with Camarillo as their home library: to keep your Ventura County Library services smooth during this transition, the first step is to change your home location to another Ventura County Library location before 15 December 2010. Up through 15 December 2010, you may make this change at the Camarillo Library or any other Ventura County Library location (excluding the Museum of Ventura County's Research Library). If you are not able to make the change during this time, on 1 January 2011, your account will be assigned to another library in the VC Library system. Effective 1/1/11, those seeking to check books out of the Camarillo Library will have to obtain a new library card. Other than the new library card, the transition is expected to transparent. On a personal note, this is a beautiful, large library that we enjoy from time to time. Here's a link to the various libraries in and around Ventura County.